楊枝店の登場　The toothpick shops were opened. 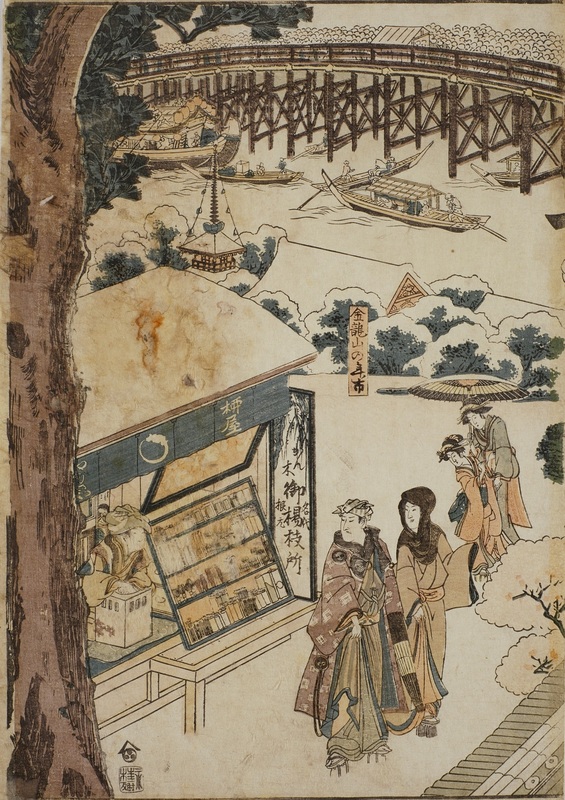 In Edo period (1624~1643) some toothpick shops appered selling them on wooden boards in streets. Gradually they builded stores and made and sold them. The craftmen boiled the top of a peace of poplar treeto make it soft and stuck it by wooden hammer to form brush like. It is the origin of toothbrush. The custom to maintain their mouth clean had become stylish and spread among common people. The shops in Sensouji in Edo, Shijyou street in Kyoto and Doutonbori in Osaka were very famous. They ordered their own softness of brush as custom made as same as the filament of toothbrush today. The pantings show the scenery of the toothpick shops. Copyright (C)童謡伝道マガジン 2018 「ふんふん」 All Rights Reserved.